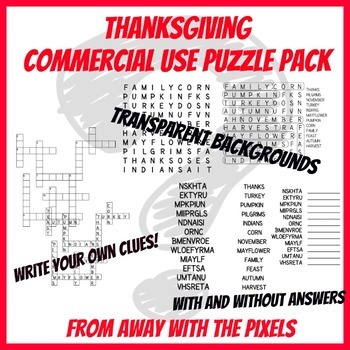 This is a set of Thanksgiving puzzle graphics which you can incorporate into educational resources to sell - these are NOT print ready puzzles! This is something a little different and I have no idea whether this has legs as far as a new product is concerned - so I'm making this available as a freebie and I'd LOVE to hear some feedback if this is something that is worth developing further (kate@awaywiththepixels.com). 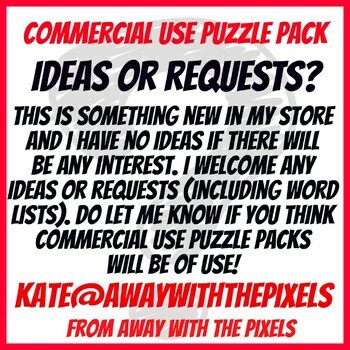 I'll also be pleased to receive word lists if there are any puzzle graphics you'd particularly like to see. 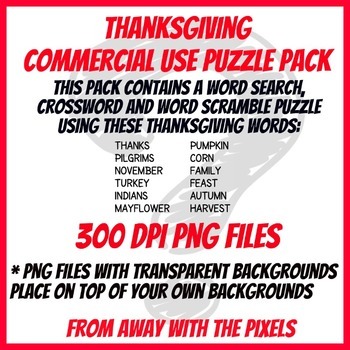 This is a set of puzzle graphics which each feature 12 Thanksgiving words (see the read me file for more detail). These are targeted at early learners (word search words read only left to right and top to bottom with no overlapping of words). I have a puzzle generator which allows me to create simple puzzles and, unlike many free puzzle generators, this program allows me to use the puzzles commercially. Using this program I can save the puzzles as graphics - as PNG files with transparent backgrounds - and this means that the graphics can be placed on to patterned backgrounds etc to create attractive puzzles for students. I was asked recently by a colleague to create some puzzles as png graphics which she could incorporate into a lesson plan for early finishers and this gave me the idea to produce puzzle graphics for commercial use which fellow sellers can use to incorporate into items to sell. You will find three types of puzzle here, word search (with words separately so you can use images etc as clues if required), word scramble, and a crossword (this is JUST THE CROSSWORD GRAPHIC with the words placed and numbered and NO CLUES so you can write your own clues or use images if required). Answers are supplied for each. These puzzle graphics are designed for commercial use. You can use the graphics to make products to sell. I simply ask that you provide credit somewhere in your product documentation.